Note: Items shown in boldface are believed to be available for purchase at the time this bibliography was last revised. No attempt has been made to include entries from encyclopedias or similar reference works. Albay, Diana T., et al., John Muir: Life and Journeys/Vida y Viajes (Earlimart, CA; Earlimart School District, 1990). Illustrated by Edward Campos, Jr. This book was written by students in the 8th Grade Honors Science Class (Dr. Bruce K. Boaz, Science Teacher) at Earlimart Intermediate School, for students at Earlimart Elementary School. Notably, this paperback biography is bilingual, with both English and Spanish text. Chapters include "Early Years", "The 1,000 Mile Walk", "California", "Earthquake", "Stickeen", "More Adventures", and "The Sierra Club". Includes an excellent one page chronology listing events in Muir's life and specifying years, U.S. President, and notable contemporaneous historical events. Anderson, Peter, John Muir: Wilderness Prophet (New York: Franklin Watts, A Division of Grolier Publishing 1995). A First Book. Color and black and white photographs, Bibliography, Index. 62 pp. Paperback: $5.95; Hardbound School and Library Binding: $19.90. A nice biography for primary grade readers, with colorful illustrations (even black and white photos have color borders). The design qualities of this book are a definite plus. Appleseeds Magazine: John Muir (April, 2011). (Cobblestone Publishing, ($6.95) Paperback 36 pgs. Full Color Suggested for ages: 7-10. The theme of this issue is John Muir and the Sierra Club. The publisher explains: Why is it important to care for the natural world? John Muir had a lot of answers to that question. "Break clear away one in a while," he said. And thanks to Muir, we have national parks to protect the country's most beautiful places, as well as the Sierra Club. 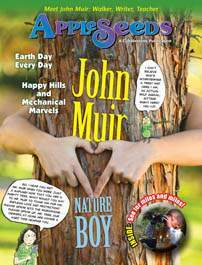 In this issue, you'll meet John Muir and get some good ideas about how to are for our earth and have a great time in the process." Archer, Jules, To Save the Earth: The American Environmental Movement (Chapter on John Muir) (New York: Viking, 1998). Illustrated, lists environmental organizations you can join, bibliography, index, 198 pp. This book for young people features lively biographies of four environmentalists: John Muir, Rachel Carson, David McTaggart, and Dave Foreman, wrapping up with a "Short History of the Environmental Movement," and concluding with a chapter on "The Fight to Save the Earth Today and Tomorrow." The chapter on John Muir begins with Muir's exciting adventure with Stickeen on a perilous glacier in Alaska, then continues to tell all of Muir's life in a very lively way. Does an outstanding job of explaining his role as a pioneer of the conservation movement and as the founder of our national park system. Other chapters cover Rachel Carson, the biologist who brought widespread visibility to the effects of pesticides and chemical wastes; David McTaggart, the organizer of Greenpeace, who introduced the tactic of nonviolent resistance into the struggle, while Dave Foreman, co-founder and former leader of the activist group Earth First!, shook up a movement that had grown complacent. Armentrout, David and Patricia, John Muir (Vero Beach, FL: Rourke Publishing LLC, 2002) ("People who Made a Difference"). Available in hard back or paperback. 24 pages, Dimensions: 0.29 x 7.36 x 7.90 inches. The publisher appropriately identifies this book as suitable for Grades 2-3, but Amazon.com (mistakenly) claims it is for grades 4-8. This book is designed with a full-page photo - either color or black-and-white - opposite each page of text. The historical photos and color shots of wild places are high-quality. In the simple, fact-focused text on each page, key words are in bold face, with the definition provided in the accompanying glossary. Also includes a very brief index, chronology, bibliography, and a link to the Sierra Club's history page for John Muir which now automatically redirects to the John Muir Exhibit. A Spanish language version of this book from the series Personas Que Cambiaron La Historia is also available. 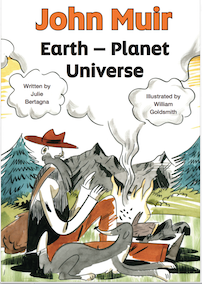 Bartagna, Julie, John Muir Earth-Planet Universe (Edinburgh: Scottish Book Trust, 2014) .ISBN 978-1-901077-27-8 Free. Illustrated by William Goldsmith. A graphic novel of John Muir's life, prepared as an educational teaching resource, with free copies going to every secondary school in Scotland, for use by S1, S2 and S3 pupils. There are also Teaching Support Notes available to accompany the graphic novel, a John Muir Quiz, and other resources for teachers. Through this graphic novel, the Scottish Book Trust hopes to ensure that Muir's legacy is also upheld in Scotland, the land of his birth. The novel combines environmental studies with literacy in an innovative way that hasn't previously been implemented in Scotland, and is supported by accompanying online resources for teachers. As well as literacy, the novel will cover many other aspects of the Curriculum for Excellence, such as citizenship, outdoor learning and health and well being. Commenting on the use of graphic novels as a way of engaging pupils in learning, Marc Lambert, Director of Scottish Book Trust, said: "The importance of taking care of the planet for future generations is one of the most vital lessons our children can learn. 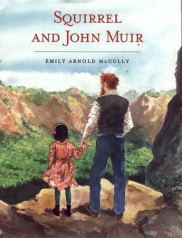 Telling the story of John Muir's life and thoughts through the highly accessible and entertaining form of a graphic novel allows us to reclaim a Scottish hero and helps children to develop a deeper understanding of the key environmental issues he campaigned for, in a creative and enjoyable way." Pete Rawcliffe, Scottish Natural Heritage's People & Places Unit Manager, said: "The values which John Muir held dear – how much nature gives us and how important it is to protect it – ring as true today as they did in Muir's day. Outdoor learning and play is important in giving our young people the best start in life and supporting their education. This lively, fun book is a terrific tool to get children thinking and talking about nature, and to encourage them to enjoy the great outdoors. The wonderful stories and drawings certainly made me keen to get out and see more of Scotland's nature myself!" Written by award-winning author Julia Bertagna and illustrated by Glasgow-based artist William Goldsmith, the novel is based on the key moments and life adventures of John Muir and is intended to help children develop a deeper understanding and awareness of the natural environment and the importance of protecting wild places. Download free PDF from Scottish Book Trust. 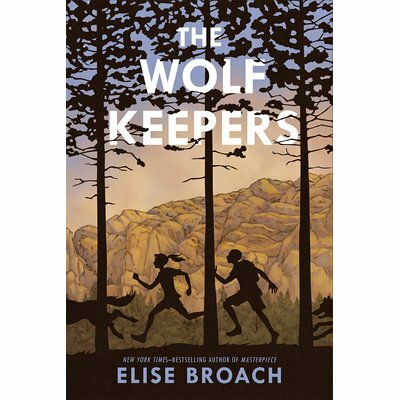 Broach, Elise, The Wolf Keepers. New York: Henry Holt and Co. (BYR) Holt Books for Young Readers (October, 2016), 343 pages. This novel for children features a story about 12-year old Lizzie whose dad is a zookeeper at a fictional California wildlife park named for John Muir. The story involves mysterious goings-on with dying wolves at the zoo, which Lizzie and her new friend Tyler try to solve. Parts of the puzzle involves John Muir's "lost cabin" in Yosemite, and stories about him and inspirational quotes from his writings. The author states that while the two children featured in the story are from her imagination, the historical characters in the novel are real, including John Muir and the first woman park ranger, Clare Marie Hodges. A fast-paced adventure-mystery story, the book is imbued with messages about John Muir, from Lizzie writing a natural journal in emulation of Muir, to reading some of his writings and letters. There is a book jacket summary and photo of book cover for this book. Byrnes, Patricia, Environmental Pioneers (Chapter on John Muir) (Minneapolis, Minn., the Oliver Press, Inc., 1998). Illustrated, includes Introduction, summary of America's Public Lands, Sources for Information, Bibliography, and Index. 160 pp. Part of the publisher's "Profiles" series, this book features illustrated biographies of modern environmentalists; in addition to John Muir there are chapters on Jay Norwood "Ding" Darling; Rosalie Edge; Aldo Leopold; Olaus and Margaret Murie; Rachel Carson; David Brower; and Gaylord Nelson. The Chapter on John Muir is a good straight-forward account of his life, emphasizing his work preserving the wilderness. Clark,Margaret Goff John Muir, Friend of Nature (Champaign, Illinois, Garard (Discovery Books), 1974). Illustrated by Cary. A short, illustrated biography, suitable for third to fourth grades or read aloud to younger grades. 80 pg. Cobblestone Magazine, "John Muir: Friend and Protector of Nature", in Cobblestone Magazine , August, 1989. Available from Cobblestone Publishing , 30 Grove St., Peterborough, NH 03458. The theme of this special issue of the Children's history magazine is "The Environmental Movement". In addition to the story about Muir, other conservationists such as Aldo Leopold and Rachel Carson are highlighted, along with photographs and a highly readable account of the growing environmental movement up to the present day. Includes student project ideas. Cornell, Joseph John Muir: My Life with Nature (Nevada City: Dawn Publications, 2000) Illustrations by Elizabeth Ann Kelley and Christopher Canyon. Paper, $8.95, ISBN 1-58469-009-7, Ages 10-16, 72 pages, 34 photo/illustrations, includes "Further Reading" and credits, 6" x Ê9." An unique "autobiography" of John Muir for children and adults, delivers John Muir to us through the "Sharing Nature" outdoor education philosophy. Author Joseph Cornell of Sharing Nature with Children fame explains, "To stay true to the spirit of Muir as clearly and fully as possible, I have told his story as if he were alive, using his own words and colorful expressions as often as possible. I have, however, simplified and condensed his words to make them more accessible to young readers." Cornell includes about ten journal-writing activities that assist in appreciating Nature through the inspiration of John Muir. Dines, Glen, John Muir (See & Read Biography) (New York: Putnam, 1974). A short, illustrated biography for primary grade children. 64 pp. Douglas, William O., Muir of the Mountains	 (San Francisco: Sierra Club Books, 1993). Illustrated by Daniel San Souci.183 pp. Hardcover. A reprint of the 1961 classic children's biography of Muir by the late U.S. Supreme Court Justice William O. Douglas, himself a noted mountaineer and conservationist. Ages 9 -12. New illustrations. Highly recommended. Excerpt: "John Muir's Public Service"
Dunham, Montrew, John Muir: Young Naturalist (Indianapolis: Bobbs-Merill Co., 1975; (New York: Aladdin Paperbacks (Simon and Schuster), 1998). Illustrated by Al Fiorentino. This children's biography, part of a "Childhood of Famous Americans" series, is suitable for 3rd to 6th grades. 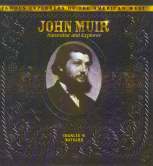 Includes appendices entitled "When John Muir Lived" (other events in history during Muir's lifetime); "Do You Remember" (questions testing the reader's memory about Muir's life); "Its Fun to Look Up These Things" (leading questions about geography and conservation); "Interesting Things You Can Do"; "Other Books You May Enjoy"; and "Interesting Words in This Book". 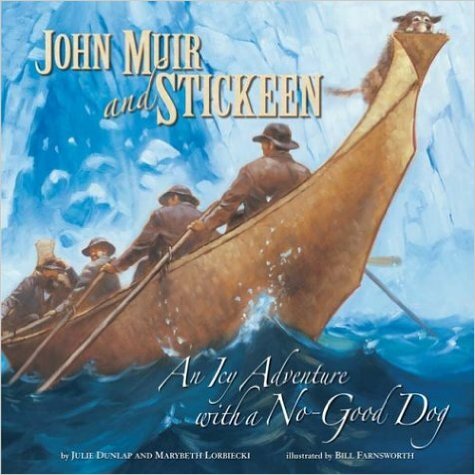 Dunlap, Julie & Marybeth Lorbiecki; Illustrated by Bill Farnsworth, John Muir and Stickeen: An Icy Adventure with a No-Good Dog (NorthWord Press, October, 2004). A beautifully-illustrated children's book based on Muir's own book Stickeen, which tells the thrilling adventure of how Muir set off to explore an Alaskan glacier one day, with the unwelcome accompaniment of Stickeen, and ran into a storm. What happened on that terrifying day made Muir see domestic animals in a new light. For ages 5-8, Grades 1-4. The School Library Journal opines: "Although not the first picture-book version of this story about a harrowing 1880 expedition to Glacier Bay, this excellent rendition is the best treatment so far." The Journal goes on to note: "The only flaw in the text is that the authors overplay the naturalist's disdain for dogs in general. While Muir's own Stickeen (Houghton, 1909) does confirm that he thought Stickeen to be "small and worthless" and likely to "require care like a baby," he also states plainly that he did generally like dogs. Apart from this minor mis-characterization, they do a fine job of conveying the wonder that inspired the man's life work and the peril of this particular exploit. While some portions are condensed and others drawn out, they generally remain faithful to Muir's own accounts. " 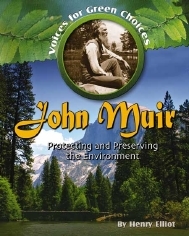 Elliot, Henry, Voices for Green Choices: John Muir: Protecting and Preserving the Environment (New York: Crabtree Publishing Company, 2009), 48 pp., illustrated. A lavishly illustrated children's biography, part of the "Voices for Green Choices" series is suitable for 5th to 8th grades. Photographs include scenic, historic, and wildlife topics related to Muir. Emphasis is on Muir's actions and writings, and his founding of the Sierra Club, crediting him as one of the shapers of the modern environmental movement. Chapters cover Muir's camping trip with Theodore Roosevelt, his boyhood in Scotland and Wisconsin, his 1,000 mile walk to the Gulf, his California years (including his campaigns for Yosemite Valley and Hetch Hetchy Valley), and a final chapter on how Muir's legacy and struggles continue. Engaging sidebars on every page include quotations, photo descriptions, and supplemental material on such things as amateur ornithology and keeping a nature journal. Includes a Chronology, Glossary, Further resources, and index. Highly recommended. Force, Eden, John Muir (Englewood Cliffs: Silver Burdett Press, 1990). Part of "Pioneers in Change" series. Paperback, $7.95, 145 pp. This new inexpensive children's biography, mostly text but with a number of historical photographs, is suitable for older elementary through junior high readers. Includes a chronology of Muir's life, a bibliography, and an index. This short but beautiful picture book for very young children, suitable for grades 1-3, begins as a young boy is bothered by the sound of crashing trees in his beloved piney forest, making room for stores. When Sammy says "trees are better than stores," his Grams tells him he sounds like John Muir, and explains she has a button that once belonged to John Muir. Something magical happens every time Sammy opens Gram’s button box. Gram's button box is full of famous people's buttons. Shortly, he is off on an adventure where he actually gets to meet John Muir, the man who helped our country establish a system of national parks and forests for all to enjoy. Sammy learns from John Muir how he can save trees. A book jacket summary is available. Goldstein, Natalie John Muir (Conservation Heroes) (Chelsea House (An imprint of Infobase Learning), available from publisher in Library Binding or ebook formats, 2011) Illustrated, 139 pages. This 139 page book intended for school libraries is part of the publisher's "Conservation Heroes" series,which includes Ansel Adams, Rachel Carson, Jane Goodall, Al Gore, and several others. The book is for ages 10 and up, grades 5 and up. The 10 chapters are not just historical, but place Muir into context with today's geography and environmental issues. The engaging text covers Muir's whole life and personalizes Muir, though sometimes putting the author's opinions and interpretation into the text. The focus is on the events that shaped his life and the author examines the development of his world view, his love of nature, and his passion for preservation. The graphic design and choice of photographs and side bar information is excellent. The last chapter discusses "Muir's Legacy" to current environmental issues. The book includes end sections on "How to Get Involved," a Chronology, Glossary, Bibliography, Further Resources, Picture Credits, Index, and "About the Author." Graves, Charles, John Muir (New York: Thomas Crowell Co. 1973). Illustrated by Robert Levering. This children's book, well-written with a modern theme of ecology, is especially suitable for second to fourth grade readers. Color and black-and-white photographs on literally every page enhance this simple biography suitable for grades 1-3. This book fills an important gap, providing an excellent biography of Muir's life for younger readers, for a very reasonable price. Large print. Includes chart of Important Dates and Index. Grody, Carl, A Walk with John Muir (Boston: Houghton Mifflin Company, 2005). Part of Houghton Mifflin's Social Studies Individual Book On-Level for Grade 5 Unit 1: A Walk with John Muir. 16 pp. This illustrated booklet for fifth graders has 2237 words and 9 black and white photographs. The text tells the story of Muir's life and his importance very simply, but in an interesting way.. The inside back cover has an exercise titled "Responding" with study questions to help student this about what they have read. A suggested activity is to form two teams to debate the Hetch Hetchy argument. Grossman, Adrienne Moss and Beardwood, Valerie, Trails of His Own: The Story of John Muir & His Fight to Save our National Parks (New York: Longmans, Green & Co. 1961). An imaginative biography of Muir, suitable for 6th to 8th graders. 206 pp. Haines, Madge and Morrill, Leslie, John Muir: Protector of the Wilds (New York: Abingdon 1957). Illustrated by Avery Johnson. This biography is suitable for fourth to sixth grade children. 128 pp..
Ito, Tom, The Importance of John Muir (San Diego, CA: Lucent Books 1996). Part of "The Importance Of... biography series. 109 pp. Billed as "Quality Nonfiction for Libraries and Classrooms" this book differs from many children's biographies in that the quotations are all from original sources, and there is no fictionalized dialogue. Each chapter is sub-divided into sub-sections, with frequent excerpts directly form Muir's writing set off by attractive borders. Amply illustrated with photos and maps. Includes footnotes, bibliography, and index. Kallen, Stuart A., Earth Keepers (Chapter on John Muir) (Edino, MN: Abdo & Daughters 1993). Part of the "Target Earth TM Earthmobile SM Environmental Science Library." Illustrated, hardbound, 47 pp. A chapter on John Muir (nearly half the book) is included in this book which also describes the lives of environmentalists Rachel Carson and Jacques-Yves Cousteau. The book is severely marred by its full-page introductory picture definitely being someone else with a beard -- NOT John Muir! The text, however, is mostly accurate and serves as an useful introduction to Muir for young readers, within the context of environmentalism. Includes Glossary and Index. Koehler-Pentacoff, Elizabeth, John Muir and Stickeen: An Alaskan Adventure Illustrated by Karl Swanson. (Brookfield, CT: Millbrook Press, 2003). 0.40 x 11.50 x 8.66; available in both hardbound and paperback; 32 pages. One of two illustrated children's books about Muir's exciting and dangerous adventure on a glacier with a brave and loyal dog. The author tells the story in the present tense, which may discomfit some: "Mountain streams crash upon boulders. Trees bend in the wind. John loves the excitement. He enjoys nature's fierce weather." Full-color illustrations by Karl Swanson are intended to highlight the hostility of the environment and the incredible courage of Muir and his canine companion. 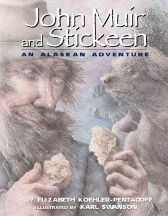 The acrylic and colored-pencil illustrations portray the Alaskan wilderness, whether forest or glacier, in an often indistinct, ghostly, lightly-tinted bluish-mauve texture, giving the effect of everything - especially Stickeen himself - being coated with hoarfrost. This approach emphasizes the rugged weather, but lacks naturalism. A one-page end note tells about Muir's life and contributions to wilderness preservation. For Grades K-3. 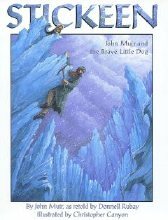 For older grades, see Donnell Rubay's book, Stickeen: John Muir and the Brave Little Dog below. Krensky, Stephen, Four Against the Odds: The Struggle to Save our Environment ( Chapter on John Muir) (New York: Scholastic, Inc., 1992). Illustrated, paperback, bibliography, index, 105 pp. This book is about four people who realized the peril to our environment, and vowed to do something about it: John Muir, Rachel Carson, Lois Gibbs, and Chico Mendes. The John Muir chapter nicely tells the story of Muir's life and his campaign to preserve America's wilderness, including Yosemite National Park. Each chapter incorporates valuable historical context that clarifies the political and economic opposition each of these environmentalists faced. Although each of the four people covered in this book came from different times and backgrounds, each of them bravely acted to protect the environment in the face of great opposition by those with economic interests. Other Chapters cover Rachel Carson, the biologist who fought the chemical industry to tell them how pesticides were not only killing insects, but wildlife and people as well; Lois Gibbs, who battled bureaucracy and ignorance to help her neighbors in Love Canal, a neighborhood built on a toxic waste dump; and Chico Mendes, a rubber tapper in Brazil who was murdered because he fought to save the rainforest. 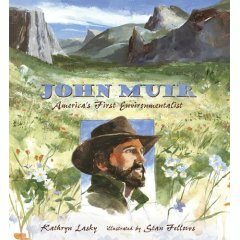 Lasky, Kathryn, John Muir: America's First Environmentalist (Candlewick Press, 2006) Illustrations by Stan Fellows; 48 pages, ages 4 to 8. This richly illustrated picture book tells the story of John Muir (1838-1914). Kathryn Lasky writes that Muir "was drawn to the mountains as if by a magnetic force." Muir was drawn not only mountains, but to all of nature - the shores and moors of Scotland, the backwaters of Florida, the glacial bays of Alaska, the giant Sequoias of California, the Deodars of India, the Eucalyptus forests of Australia -- each was a wonder in his eyes, each a responsibility to protect and preserve. Lasky quotes liberally from Muir's journals. Ledbetter, Cynthia E. and Richard C. Jones, John Muir (Vero Beach, FL: Rourke Publications, Inc., 1993). Rourke Biographies: Pioneers, 112 pp., 14 color & 16 b&w photographs, Index, Hardcover. Locker, Thomas John Muir: America's Naturalist (Golden, CO: Fulcrum Publishing, 2003); 32 pages; 11 x 8.5 inches; full-color paintings; hardbound with dust jacket. Forward by Dr. Edgar Wayburn, Honorary President of the Sierra Club. Includes two pages of quotations from John Muir. This is the first true "picture book" focusing on John Muir. Fifteen full page landscapes are featured, each depicting Muir in the context of wilderness. One image shows Muir writing at his study desk, the rest show him as an usually small figure in a glorious natural landscape. Like many children's picture books, adults will enjoy the high-quality paintings and accompanying text as well. Each painting is accompanied by two or three sentences in simple language about milestones in Muir's life, placed on a color background matching the painting on the right. Also, on the bottom right of each text page, there is a short John Muir quotation. 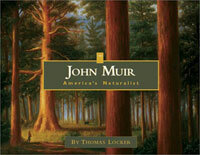 Also available as a companion to this book from the same publisher: Teacher's Guide to Thomas Locker's John Muir: America's Naturalist , by Joan Franklin Smutny, 8.5 x 11, Grades 4-8, Blackline Masters, tie-in to national standards, language arts exercises, 22 pages, $9.95, ISBN 1-55591-492-6. The teacher's guide primarily focuses on questions and activities to stimulate ideas for daily nature journal entries. The questions encourage students to write not only from Locker's paintings, but from their own experience in the outdoors. A second part offers ideas for student essays, poetry, short stories, and biographies and autobiographies. One page includes some ideas for science, but assumes the teacher independently has the science information needed for the exercise. A larger book cover image and book jacket summary of both the book and Teacher's Guide is available. Mara, Wil, John Muir (Children's Press, A division of Scholastic, Inc., 2002). ("Rookie Biographies") Available in School and Library binding or Paperback: 32 pages; Dimensions: 0.08 x 7.06 x 6.08 inches. A very easy-to-read book suitable for grades 1-2. The book design consists of a photo on one page, with a single-sentence text on the opposing page. The photos include high-quality color and black-and-white historical photographs. The text briefly tells the story of Muir's life, including formation of the Sierra Club. Some of the longer words, like "naturalist" and "Roosevelt" include a pronunciation key. An unique substitute for a glossary at the back of the book is a section entitled "Words You know" accompanied by smaller versions of the photos used in the main body. Includes a brief index, a two-line "About the author" and photo credits. Maruca, Mary, A Kid's Guide to Exploring John Muir National Historic Site (Tucson, AZ, Western National Parks Association, 2000). 14 pp., illustrated, paperback, $3.95. 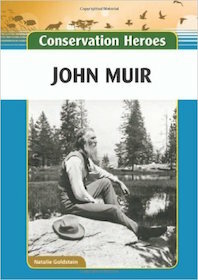 Available from John Muir National Historic Site Bookstore. Multiple color photographs and graphics on each page enhance this beautiful little booklet. Despite the book's title, the book is primarily a very brief biography about John Muir, with just the last one-third emphasizing his fruit ranch home in Martinez. The author and designers did a great job of making Muir a friendly, human person of interest to kids. Highly recommended. Maynard, Charles, John Muir: Naturalist and Explorer (New York, NY: The Rosen Publishing Group, Inc., 2003) 24 pp., hardbound, illustrated, Timeline, Glossary, Index, Primary sources, Web Sites. McCully, Emily Arnold, Squirrel and John Muir (New York: Farrar, Strauss & Giroux, 2004) 40 pages; Size: 8 1/2 x 11 1/2. Full-color pictures throughout; Author's note, bibliography; for ages 4-8). This nice picture book imagines Muir through they eyes of a young girl, Florence (Floy) Hutchings, nicknamed Squirrel due to her wild tomboyish ways. Based on historical fact, 7 or 8 year-old Floy met 30-year old Muir when he became a hired hand at her father's Yosemite Valley tourist hotel. Author and illustrator McCully creatively imagines Muir and Squirrel taking hikes and studying rocks, plants, insects, and birds together. Large watercolor paintings throughout the book vividly capture the beauty of Yosemite. Blending colorful art-work, natural history, and a moving personal relationship, this is a wonderful book for young readers. An author's note at the end explains how this fictionalized retelling of an actual relationship is based on the true character of the famous Scottish naturalist. Both his gentle personality and steely determination to see his beliefs recognized by his peers come through clearly. The note also tells what eventually happened to the real Florence Hutchings, who was determined to never grow up "if it meant being a lady." McCully doesn't mention it, but, intriguingly, this is not the first time Florence Hutchings has been depicted in fiction: In Thérèse Yelverton's 1872 novel, Zanita: A Tale of the Yo-Semite , the character of Zanita is only a thin disguise for Mr. and Mrs. J. M. Hutchings' young daughter Florence (Floy). Miller, Barbara Kiely, Great Americans: John Muir (Pleasantville, NY: Weekly Reader® Books, An imprint of Gareth Stevens Publishing, 2008) 24 pp, illustrated, Glossary, "For More Information," and Index. Hardbound: $19.95; Paperback: $5.95. A very simple three-chapter biography of Muir designed for grades 2-4: Levels: GR:M, DRA: 28, running word count: 921. Color and black and white photographs illustrations enhance every page. 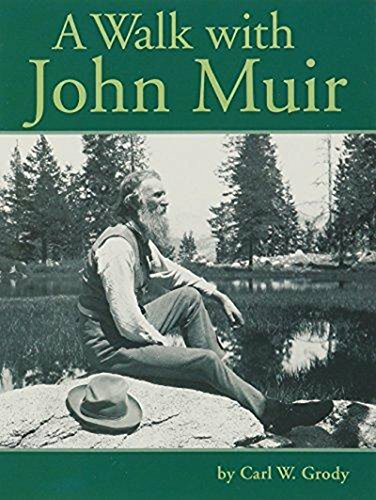 Brings Muir alive for younger readers, including his legacy as Father of our National Parks, first president of the Sierra Club, and being honored in the 2005 California Quarter. Unfortunately, like most Muir biographies for children, omits the tragedy of Muir's loss of Hetch Hetchy Valley. The book does give a good summation: "John Muir remains an example for everyone who cares about Earth.... His work guides people who are fighting climate changes or saving wild places." 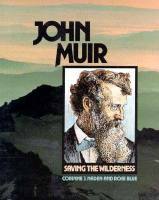 Naden, Corrinne J. and Blue, Rose, John Muir: Saving the Wilderness	 (Brookfield, CT: The Millbrook Press, 1992). (Distributed by Houghton Mifflin) A Gateway Biography, 48 pp., illustrated, paperback, $4.95. This well illustrated biography is suitable for the late primary grades. Excellent choice of modern and historical photographs, except for one mistakenly identifying a much larger reservoir as Hetch Hetchy. Includes "Important Dates" in Muir's life, bibliography, and index. The bibliography emphasizes not history but current conservation issues. Norman, Charles, John Muir, Father of our National Parks (New York: Messmer 1957). Although currently out of print, still widely available in many libraries; this biography is suitable for junior high to adult readers. 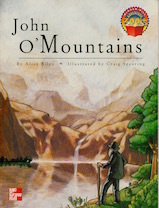 Riley, Alice, John O'Mountains (New York: McGraw-Hill, 1997), Illustrated by Craig Spearing. 16 pp, black and white illustrations, paperback. ISBN No: 0-02-14777-9. Rosenstock, Barb, The Camping Trip that Changed America: Theodore Roosevelt, John Muir, and our National Parks (Dial Books for Young Readers, a division of Penguin Young Readers Group, 2012). Illustrated by Mordicai Gerstein. 32 pages, ISBN 0803737106. 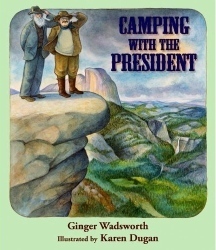 Like Ginger Wadsworth's 2009 book Camping with the President (see below) this award-winning children's book tells the story of John Muir's 1903 camping trip with President Theodore Roosevelt. While Wadsworth's book is written for older readers, this one is suitable for younger readers, ages 6 -8, grades 1 - 3 or older. As both authors note, camping by themselves for three nights in Yosemite, the two men saw sights and held discussions that would ultimately lead to the establishment of many new national parks and national forests. An Author's Note on the last page explains how the story is based on truth, but with some imagined and invented dialog, and provides a list of sources. The text focuses on the men's enjoyment of the outdoors, with several of Muir's stories (like his famous bear encounter) thrown in, then ending on the historical importance of their camping trip. Gerstein contributes very nice line-and-watercolor illustrations, including small portraits of the men, a memorable scene showing two figures dwarfed by giant sequoias, and a close-up of the men talking around their campfire. Strangely, there is no illustration depicting the famous photograph of Muir and Roosevelt standing on Glacier Point with Vernal and Nevada Falls in the background. As nominee for the 2014-2015 California Young Reader Medal, a list of related books is available. Other awards include a Parents' Choice Award - silver medal, California Public Library Association Beatty Award, Illinois Monarch nominee, Maryland Black Eyed Susan nominee, South Carolina Picture Book Award nominee, Chicago Public Library "Best of the Best" list, Washington, D.C. Capitol Choices List, BookList Top 10 Books on the Environment for Youth. Silverberg, Robert, John Muir: Prophet Among the Glaciers	 (New York: Putnam, 1972). Part of the publishers "Lives to Remember" series, this modern biography is suitable for 6th to 8th grade students. 255 pp..
Stanley, Phyllis M., American Environmental Heroes (Springfield, NJ: Enslow Publishers, Inc, 1996). Illustrated, with index, 128 pp. This well-designed, illustrated book features ten environmental heroes from the past and present - both 19th century and 20th century figures. 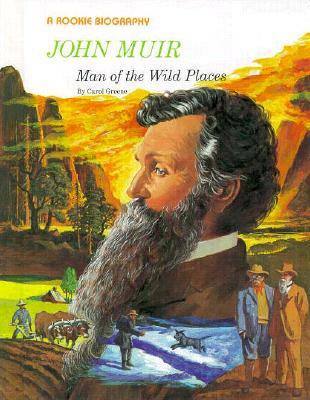 John Muir is covered in chapter 2 as the Sierra Club Founder. Other environmental heroes included are: Henry David Thoreau, Ellen Swallow Richards, George Washington Carver, Aldo Leopold, Rachel Carson, David Brower, Barry Commoner, Sylvia Earle, and Frances Moore Lappé. For grades 6 - 9. Swift, Hildegarde Hoyt, From the Eagle's Wing: A biography of John Muir . (New York: William Morrow & Co., 1962). Illustrated by Lynd Ward. An excellent biography for older elementary and junior high to high school readers. Highly recommended. Talmadge, Katherine S., John Muir: At Home in the Wild (New York: 21st Century Books, Henry Holt & Co., 1993). Illustrated by Antonio Castro. Hardcover, 80 pp. Suitable for grades 3-5, this new biography is a good introduction to Muir, emphasizing his accomplishments as a conservationist. Part of the publishers "Earth Keepers" series which portrays many noted historical and contemporary environmentalists, it includes numerous black & white sketches, a glossary and an index. Tolan, Sally, John Muir: Naturalist, Writer, and Guardian of the North American Wilderness (Milwaukee: Gareth Stevens Children's Books, 1990). Part of "People Who Have Helped the World" series. Hardcover, $12.95, 68 pages. An excellent new biography for the 90's for fifth and sixth grade readers. Illustrations and a creative design greatly enhance this book, with color and black and white photographs, charts, and maps; also including quotations by and about Muir and conservation philosophy. Does an excellent job of relating Muir's life and work to contemporary environmental issues and concerns. Includes addresses for further information, a short bibliography, a glossary, a chronology of Muir's life, and a one-page index. Suitable for either home or classroom use. Topp, Patricia, Call Him Father Nature: The Story of John Muir (Nevada City, CA, Blue Dolphin Publishing, 2001) Paperback, Illus., 97 pages, Dimensions: 0.32 x 8.48 x 5.56 inches. For ages 8-12, this book is simple, entertaining and well-written. The text emphasizes the young John Muir, and ends about 1880 when Muir was age 42, except for a brief epilogue about his achievements. Except for two photos of Muir, the illustrations are clip-art. This book's lack of coverage of the Hetch Hetchy battle is a major weakness. Otherwise, it is a readable book for this age group. Also includes two outline maps of California and Alaska showing Muir's travels. Wadsworth, Ginger, John Muir: Wilderness Protector	 (Minneapolis: Lerner Publications Co., 1992). Hardcover, $15.95, 144 pages. Superb modern biography of Muir, with emphasis on his conservation efforts. Grades 5 and up. Contains extensive photographs, many never before published. Includes index, quotation sources, historical map of Muir's Yosemite, and bibliography. A thorough and readable juvenile biography. Wadsworth, Ginger, Camping With the President (Honesdale, PA: Calkins Creek Books, 2009) Hardcover, 32 pages. 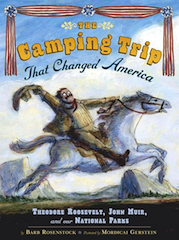 Excellent picture book for ages 8 and up, and grades 4–6, telling the story of John Muir's 1903 camping trip with President Theodore Roosevelt. Author Ginger Wadsworth is noted for her careful research, but some details may be vague; this is made up by the excellent author and source notes at the back of the book. The watercolor illustrations in this book are superb. Awards: Smithsonian Notable Books for Children 2009. While this book is written for older readers, Barb Rosenstock's book The Camping Trip That Changed America (see above) is another picture book on the same topic suitable for younger readers, ages 6 -8, grades 1 - 3. A book jacket summary for this book is available on our site. Warrick, Karen Clemens, John Muir: Crusader for the Wilderness	 (Berkeley Heights, NJ: Enslow Publishers, Inc., 2002). 128 pages, Illus., black and white photos, Chronology, Chapter Notes, glossary, Further Reading and Internet Addresses, Index. A thorough and entertaining modern biography of Muir, covering his entire life. For Grades 5 to 10. A thorough and readable juvenile biography. Although there are quite a few photos, few are of Muir himself, except for the front cover image used as a frontispiece. Includes URL for the John Muir Exhibit as one of four Internet addresses. Weitzman, David, The Mountain Man and the President (New York: Steck- Vaughn Co., 1993). Illustrated by Charles Shaw, Paperback, $4.95, (also available in hardcover), 40 pages. This short story-book for elementary school readers focuses on the 1903 Yosemite camping trip shared by John Muir and President Theodore Roosevelt. The book is excellent in explaining how this historical event relates to the importance of wilderness in our lives today, and the continuing need to protect wilderness for the future.